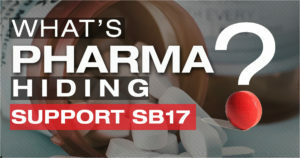 Governor Signs SB 17 (Hernandez)—the strongest prescription drug transparency bill in the country! Victoria Stuessel is 32-year old wife and mother from La Puente, California. A year ago she was diagnosed with Multiple Sclerosis (MS) which is a disabling disease of the central nervous system. She was put on a cocktail of drugs that costs her and her family $7000 a month, even with their health coverage. She also takes six drugs to treat the symptoms of MS that cost over $1,200 a month. When Victoria relapses, she needs a 5-day IV infusion of very expensive high-dose steroids—and she never knows when she’ll need them so it’s impossible to budget for that expense. There is no cure for MS. These are drugs that Victoria will have to take every day for the rest of her life. Victoria’s story is just one of millions in California and across the country. Stories of workers and patients who have to pay hundreds of thousands of dollars out-of-pocket for the drugs that keep them healthy, keep symptoms at bay and save their lives. This is in addition to the billions of dollars that go to prescription drugs paid for by health plans—all of it driving up the cost of health care for everyone. Whether we take prescription drugs or not, we are all paying for them. Prescription drug costs are the fastest growing driver of health insurance premium increases. Every dollar that we pay for health coverage is a dollar coming out of the pockets of workers. It’s money that is not on the table for raises, pensions and job creation. Where is all this money going? It’s going to pad the profits of Big Pharma; it’s going to Pharma CEO salaries and it’s going to marketing new, flashy drugs that aren’t necessarily more effective than generics. Big Pharma is the one player in the health care industry that has escaped the transparency and regulation required by the Affordable Care Act and by the many strong laws we have in California. That’s why a broad coalition of labor unions, business, patients groups, health plans, hospitals, doctors, cities and basically everyone BUT Pharma joined together to tackle the issue of skyrocketing prescription drug prices by moving SB 17, authored by Senator Ed Hernandez. The bill requires drug companies to give purchasers 60-days advance notice before an “excessive” price increase—time for us to negotiate better prices, find alternatives, and prepare our budgets. It’s a simple, modest bill, but one that Pharma opposed tooth and nail—and managed to kill in 2016. But Pharma did not scare the members of the SB 17 Coalition. Victoria Steussel came to Sacramento to lobby lawmakers in support of the bill, despite the fact that her MS exhausted her and made the lobbying slow and painful. She joined other activists from the MS Society, AARP, Health Access, Next Gen and countless other groups. The true leaders of SB 17 were union members. UNITE HERE brought hundreds and hundreds of members to the Capitol to lobby, attend press conferences, and to do district visits, doorhangers in key districts and calls to district offices. IATSE members also came up to lobby as well. It was the power and true grit and determination of the labor movement that paved the way for SB 17 to move. Because union members know all too well how much prescription drugs cost them at the pharmacy and at the table when they’re in contract negotiations. Despite Pharma’s army of lobbyists, wheelbarrows of cash and flashy ads and media buys, the coalition got SB 17 to the Governor’s desk and today he signed it into law, making SB 17 the strongest and most comprehensive drug transparency law in the COUNTRY. SB 17 is a model for the rest of the nation, not just as a policy, but as a lesson that strong coalitions led by the Labor Movement can defeat the most formidable opponents and can make real change in people’s lives. Workers Standing Together can do great things for working people.